Repetitive long-term Vaccinia Melanoma Cell Lysate (VMCL) vaccination schedules have proved clinically effective in producing Complete Responses and strong durable survivals for up to 6.1 years in a previous study of patients with advanced Stage IV and Stage IIIc melanoma. These studies were expanded to include 54 patients for further evaluation of these findings. 54 patients comprising 48 Stage IV (6 M1a, 14 M1b, 28 M1c) and 6 advanced Stage III (5 IIIc; 1 IIIb) were studied using repeated intra-dermal VMCL vaccine therapy. If disease progressed, vaccine was continued together with standard chemotherapy (DTIC and/or Fotemustine). Overall survival was the primary end-point assessed, with clinical responses and toxicity recorded. From vaccine commencement, median overall survival was 14 months, ranging from 4 to 121 months. Kaplan-Meier survival analysis demonstrated overall 1, 2 and 3-year survival estimates of 57%, 26% and 18.5% respectively, and overall 5-year survival of 15.4%. No appreciable toxicity was observed. Complete Responses (CR) occurred in 16.7% (9) and partial responses (PR) in 14.8% (8) of patients. Stable disease was noted in a further 25 patients (46.3%). No response to therapy was apparent in 12 patients (22.2%). The overall response rate was 31.5% (CR + PR), with clinically significant responses (CR + PR + SD) in 77.8% of patients. Strong, durable clinical responses with overall survivals ≥ 23 months occurred in 29.6% of patients treated with repeated VMCL vaccine for advanced melanoma, (+/- concurrent chemotherapy). Prolonged, repetitive VMCL vaccination immunotherapy appears to be a clinically effective means of generating relatively high CR rates, useful clinical responses and long-term survivals, with little toxicity, but remains notably under-explored. Successive immunomodulation might explain the results. Closer analysis of repetitive dosing is required to improve clinical response rates and survival, perhaps by optimising the timing of immunotherapy delivery. Australian and New Zealand Clinical Trials Registry ANZCTRN12605000425695. Survival of patients with advanced disseminated melanoma remains poor using almost any therapeutic means currently available. In those relatively rare situations where surgery can be utilised in selected patients with metachronous or synchronous metastatic melanoma deposits, 5-year survivals of 5-35% have been reported [1–3]. Recent advances in transduction pathway inhibition with B-raf and MEK, or immunotherapy using CTLA-4 and PD-1/L1 inhibitory antibody therapies have produced some encouraging results [4–14]. However, the majority of the clinical responses have not been translating into complete responses (CR), nor long-term survivals. The currently reported best CR rates have been associated with immunotherapies such as interleukin-2 (IL-2) (5-10%), combined IL-2 and CTLA-4 inhibitor therapies (17%), vaccine therapy (18.9%), and cellular therapy (22%) [8, 15, 16]. Vaccinia Melanoma Cell Lysate (VMCL) vaccine therapy has been reported previously, and the role of the immune system, vaccines and immuno-chemotherapy have been discussed [15, 17–23]. The results of an initial pilot study using repeated doses of VMCL vaccine therapy in 37 patients with advanced surgically non-resectable stage IV/ IIIc metastatic melanoma demonstrated a CR rate of 18.9%, with strong durable survivals for up to 6.1 years, and survival rates of 40.5%, 21.6% and 10.8% at 1, 2 and 3 years respectively . The primary aim of the present study was to investigate overall survival, with clinical response rates and toxicity also being evaluated, using the repetitive VMCL vaccine therapy approach, in a larger cohort of 54 patients with surgically non-resectable advanced Stage IV/ III in-transit metastatic melanoma. Informed consent was obtained before entry into the study, which was approved by the Royal Adelaide Hospital Human Research Ethics Committee and was registered with the Australian Clinical Trials Registry [ACTRN 12605000425695]. 54 stage IV/IIIc advanced melanoma patients were enrolled in these studies for the primary aim. Most patients had failed other therapies. Confidentiality of patient data was preserved. Overall quality of life was measured by assessing functional status using the standard Eastern Cooperative Oncology Group (ECOG) and Union for International Cancer Control (UICC) scores. CT scans were performed each 3 months and ophthalmology examinations (for possible melanoma associated retinopathy/iritis) each year, or as clinically indicated. Patients ≥ 18 years of age; ECOG 0-2; evaluable metastases from primary cutaneous melanoma; advanced non-surgically resectable AJCC Stage IV or Stage IIIb/c disease; tumour volume < 20 cm diameter or < 70% of organ replacement; +/- post-surgical treatment of brain metastases; voluntary informed consent. Second primary invasive cancer (not BCC, SCC of skin or resected in-situ malignancy); untreated brain metastases, extremely extensive metastatic disease, bone metastases only; high-dose oral steroid therapy; pregnant or lactating; severely atopic individuals; severe cachexia; immunodeficiency; HIV, Hepatitis B or C positive. Three patients with inoperable brain metastases were excluded. No patient was both eligible and refused to participate. Vaccinia Melanoma Cell Lysate (VMCL) vaccine was manufactured using successive aliquots of a single stable culture seed lot of the allogeneic melanoma cell line MM200, which were thawed as required, briefly cultured then infected with vaccinia virus (CSL laboratories, Melbourne) to cause cell lysis. The thawed MM200 aliquots were determined to be stable over time using karyotype, western blot and antigenic analysis. Lysed cells were ultrasonicated and centrifuged to create the allogeneic cell lysate vaccine product for use as described previously [15, 17–20]. Each vaccine had a protein content of 100mcg per 0.3 ml dose, equivalent to 5 × 106 cells per dose. Vaccine doses were frozen to preserve protein content at -20°C and thawed to room temperature before use. The process had been previously used successfully in a previous Australian randomised clinical trial for earlier-stage, completely resected high-risk melanoma . All patients received regular 2-weekly single-dose intradermal vaccinations for 6 months; then monthly for 6 months; then if stabilisation or a CR was obtained, 3-monthly thereafter. Injection sites were rotated between upper outer aspects of all 4 limbs, but avoiding any limb where lymph node dissection was performed. Previous VMCL studies using 0.3 ml of re-suspended sonicated lysate had determined safety and efficacy of this dose and schedule [15, 17–20, 24]. Occasional minimal skin reactions were noted in the pilot or previous studies, and precautionary resuscitation facilities were available (but never required) with patients being observed for 30 minutes after each vaccination. Melanoma disease progression during vaccine therapy indicated addition of concurrent standard chemotherapy (either dacarbazine (DTIC) 1000 mg/m2 at 3-weekly intervals intravenously), or fotemustine (100 mg/m2 weekly intravenously for 3 weeks, then 4 weekly thereafter) [25, 26]. Vaccinations were maintained at 2-weekly intervals throughout the chemotherapy period, including between doses and during breaks in chemotherapy. Occasional vaccine schedule adjustment was required to suit the chemotherapy schedule. The 1st and the 4th VMCL vaccination doses (0.3 ml) were investigated to examine DTH responses. Each read-out was 48 hours after vaccine administration. Erythema and the induration were recorded and independently recorded in two directions perpendicular to each other. Responses at the vaccination sites > 10 mm were considered positive. Overall survival was assessed by survival in months from the time of commencement of vaccination to the date of analysis or death of the patient. (i) Toxicity and tolerability: local or systemic reactions were recorded. (ii) Tumour response rates: Rates of Complete Response (CR), Partial Response (PR), Stable Disease (SD) and Progressive Disease (PD) were recorded using the WHO criteria . Observable subcutaneous lesions were assessed using direct size measurement using calipers or a ruler, and internal metastases were assessed using CT scans at 3-monthly intervals or as clinically otherwise determined, and where appropriate using ultrasound, MRI or Positron Emission Tomographic (PET) scans. Measurements were in two directions perpendicular to each other. This was performed using mean and median calculations, Kaplan-Meier analysis and time series analysis with the assistance of statisticians and a mathematician (TS; NB; AC). A significance level of p < 0.05 was set for all analyses. Data for these results were collected from enrolment of the first patient in November 2000, until data analysis of 54 patients at the end of 2010. The period from the date of vaccination commencement of the first patient to the end 2010 was 10 years and 1 month (3690 days). The median age of the 54-melanoma patients enrolled in the study was 66 years (range 35-97), the majority of whom had Stage IV disease. Other demographic/classification data are demonstrated in Table 1. Overall survival (to either death or the date of analysis) for all 54 patients ranged from 4 months to 121 months. Median survival was 14 months, with a mean survival of 22.5 months. A Kaplan-Meier survival analysis was performed which demonstrated overall 1, 2 and 3-year survival estimates of 57%, 26% and 18.5% respectively. The overall 5-year survival estimate was 15.4%. These are as shown in Figure 1. Kaplan-Meier survival curve for VMCL Treated Patients (n = 54). Survival duration and treatment type patterns are also shown in Figure 2 to further illustrate patient responses. 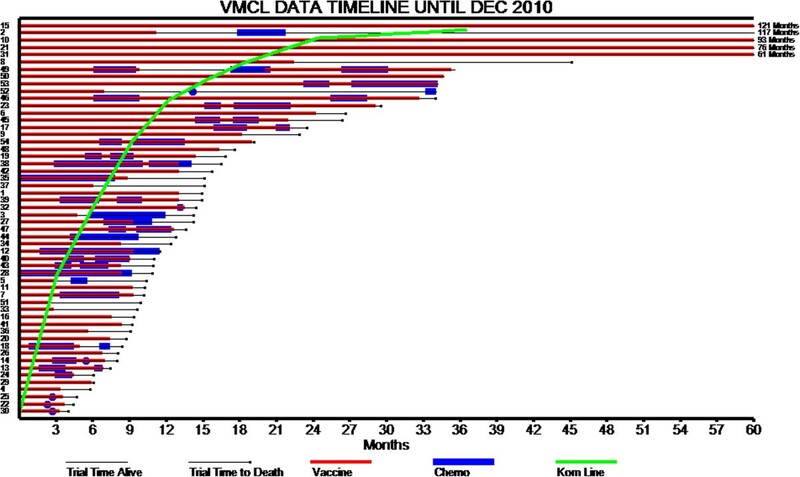 Individual patient survival and treatment data to December 2010 (n = 54) [Korn line is survival data from Korn et al.,]; time is to follow-up or death; vaccine is VMCL; Chemotherapy is systemic chemotherapy]. At analysis, an observed survival of 12 months or more occurred in 55.6% or 30 of the 54 patients. 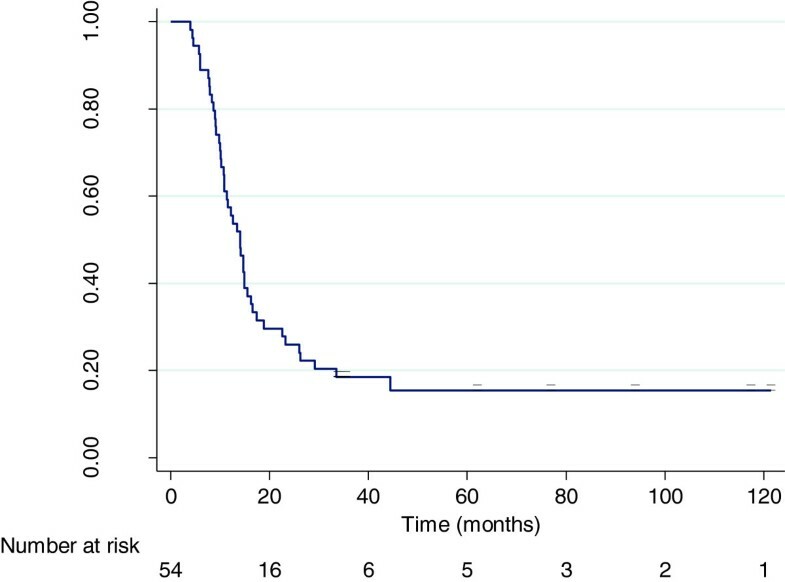 Survival greater than 23 months occurred in 29.6% (16) of the 54 patients, ranging from 1.9 years to 10.1 years. Of those 16 patients, organ +/- lymph node metastases were present in 10 patients (62.5%). Multiple subcutaneous/cutaneous metastases alone occurred in the remaining 6 patients (37.5%). Characteristics of these 16 patients are shown in Table 2. Abbreviations: s/csub-cutaneous, LN lymph nodes, GB gall bladder, S surgery, B biological therapy, ILI isolated limb infusion (of chemotherapy), R radiotherapy, AWD alive with disease. For the entire group, at the end of the survey period, 9 (17%) patients were alive and 45 (83%) had died. Melanoma was the cause of death in all 45 patients at the completion of study period. The median (mean) survival time of the 9 patients alive was 61 (67) months from vaccine commencement. Complete Responses occurred in 16.7% (9) and partial response (PR) in 14.8% (8) patients. Stable disease was noted in a further 25 patients (46.3%). In 12 patients (22.2%) no response to therapy was apparent. The overall response rate was 31.5% (CR + PR), with clinically significant responses (CR + PR + SD) in 77.8% of patients. Of the complete responders, complete durable regression of all disease beyond 18 months (alive + CR) occurred in 7 patients (12.9%). Of the 9 (16.7%) CR’s that occurred, 5 were in patients who received VMCL vaccine alone, and 4 had vaccine with systemic chemotherapy. Responses were sometimes associated with quite remarkable regression of large masses of tumour as shown in Figure 3. Effects of VMCL vaccine alone on a patient treated from August 2005 (before therapy; a) to December 2005 (during therapy; b) using repetitive dosing. She was able to walk after the therapy and the tumour size, pain, and odour decreased, with substantial improvement in self-care and walking ability. (reproduced with permission Journal of Cancer Therapy©). No toxicity issues pertaining to VMCL vaccine administration alone were experienced. Any reported toxicities were related to known standard chemotherapy side effects and appeared unaffected by concomitant vaccination. There were no significant DTH responses observed. All patients had some form of surgery prior to their entry into the trial. This ranged from surgery for initial diagnosis and wider excision, to that performed for regional or systemic metastatic disease control. Prior treatments (excluding surgery) occurred in 32 patients included chemotherapy and/or radiotherapy or experimental biological therapies (6 patients: C-vax (x2 BCG-Placebo; x1 BCG±C-Vax), Heat shock protein (x1), NYESO-Iscom matrix (x1); IL-18 (x1)). 22 patients did not receive any prior therapy. From commencement on the trial, 14 patients received vaccine therapy alone, of which 8 had received no previous therapy. As part of the study, 31 patients received systemic chemotherapy in addition to the VMCL vaccine therapy. The CR rates and long-term survivals using the VMCL vaccine approach are appreciable, even when compared with newer ‘targeted’ agents, indicating that prolonged, repetitive vaccination approaches require further detailed evaluation. Although several promising newer therapies have increased the armamentarium for management of advanced stage IV and stage III melanoma, notably B-raf, MEK, CTLA-4 and PD-1/PDL-1 inhibitory therapies, there has remained little progress in the development of treatments that induce complete responses and long-term survival for melanoma patients [4–14]. The reported complete response rates for B-raf therapies was 3-6%; ipilimumab, 0.9-1.5%; combined Braf/Mek, 2%; and PD-1, 1%; PDL-1, 6%; and CTLA-4/ PD-1, 9.6% [4–14]. These CR rates have unfortunately not yet translated into durable cure rates with long-term disease free 5- and 10-year survivals. A recent meta-analysis of 38 targeted therapies has sparked editorial comments concerning the efficacy and toxicity of numerous ‘targeted’ agents, questioning the selectivity due to ‘off-target’ effects and the level of clinical efficacy given their presumed specificity [29, 30]. Clearly, there is a current need for improvement in both complete response rates and survival times for patients with advanced melanoma. The current extended study results in 54 melanoma patients compared favourably with those previously described above (for 37 patients ) demonstrating rates of CR 16.7%; PR 14.8%; ORR of 31.5%, SD in 46.3%, with any clinically meaningful response (CR + PR + SD) in 77.8% of patients. The primary endpoint of survival was notable using the repetitive VMCL vaccine therapeutic approach. 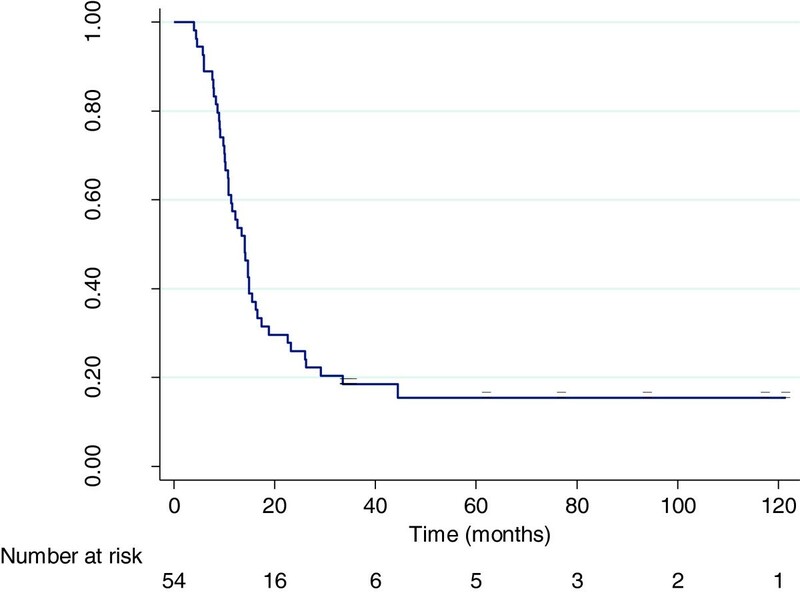 The Kaplan-Meier 5-year survival estimate in this study was 15.4%, which is itself significant, with the longest survivor currently alive at 10.1 years duration. The fact that 29.6% (16) of the 54 patients survived 23 months or longer is of significance also. Survival times within that group ranging from 1.9 years to 10.1 years are remarkable, indicating that survival could be considerably prolonged, compared with essentially all other treatments reported to date. Our overall survival data at 3-years using VMCL compared favorably with some recent preliminary results using pooled analysis of CTLA-4 antibody therapy, although the CR rate with VMCL therapy appeared appreciably higher than for CTLA-4 therapy . The resurgence of interest in immunotherapeutic methods (e.g. IL-2, CTLA4, PD-1, PDL-1) for the treatment of metastatic melanoma and cancer in general, opens new approaches to therapeutic design through the better understanding of modulation of the immune system. We reason that successive vaccination over a prolonged period can modulate the immune system in the patient, with the existing non-resectable melanoma metastases serving as persistent sources of tumour antigen. This approach of repeatedly boosting or successively immuno-modulating appears to be capable of stimulating or ‘re-setting’ the endogenous immune response occurring in the melanoma patient. The delivery of repeated boosting signals (in the form of the VMCL vaccine) may enhance immune responses by better synchronisation and coordination of the pre-existing endogenous immune response against the tumour. Indeed, induction of allergic tolerance, or the converse, allergic sensitisation, has been well demonstrated for many years. It has been increasingly appreciated and shown that repeated small doses of an antigen can induce either tolerance or responsiveness respectively, to that same antigen/allergen. The immune system appears capable of being ‘re-educated’ to even life-threatening bee-venom or peanut allergies by repetitive small dose therapies in order to induce clinically effective tolerance. The prolonged, repetitive VMCL vaccine approach we describe, might reasonably represent a reversal of this process, to effectively induce responsiveness through breaking tolerance. Indeed, repeated release of tumour antigen from the cancer in vivo might be responsible for systemic tolerance so widely observed in advanced cancer patients. We have previously suggested that multiple cancer therapy approaches are able to induce immune stimulation (even CR’s), and that the timing of the delivery of the stimulus for induction of the immune response is crucial for the immune response to be driven in the correct direction for optimal synchronisation of an effector response. The corollary is that mis-timing could drive the immune response in the opposite direction to induce tolerance rather than responsiveness [32–34]. This concept of immunotherapeutic timing and synchronisation has been extended and reviewed recently in renal cell cancer therapy using IL-2 . The recent observation of the oscillatory behavior of the immune response against cancer may allow better targeting of anti-cancer therapies [32, 33, 36, 37]. The resurgence of interest in immunotherapies, including vaccines, may open the way for careful immune monitoring, improved understanding of immune modulation, and perhaps better synchronisation of therapies, including combined therapies, in order to achieve improved clinical responses. Prolonged, repetitive VMCL vaccination immunotherapy appears to be a clinically effective means of generating relatively high CR rates, useful clinical responses and long-term survivals, with little toxicity. Successive immunomodulation through repetitive stimulation of the underlying endogenous immune response to the cancer might explain these results. This phenomenon remains notably under-explored. Closer analysis of repetitive dosing is required to improve clinical response rates and survival, perhaps by optimising the timing of immunotherapy delivery. Improved synchronisation of delivery of therapies with the existing immune response already occurring in the patient, might offer a gentler means of successful modulation of the immune response and, if true, would represent a major advancement in cancer control. The authors would like to thank: Thomas Sullivan and Dr Nancy Briggs, Statistics, Data Management & Analysis Centre, Discipline of Public Health, University of Adelaide for statistical advice; Dr Andrew Coyle for mathematical advice; Drs RG Morgan, R Hamilton, D Kotasek, K Pitman, A Taylor, I Patterson, T Proudman, J Hokin, N Marshall, G Gill and S Selva for clinical patient information and participation; Mr Martin Ashdown for reading the manuscript and for helpful discussions; Ms A Halligan for the early studies and Dr H Koga for preliminary data analysis; Professor M James, for ethical advice and support in the early part of the study. Senator Nick Xenophon for his support and to the donors and patients for their generosity and support in every way. The authors declare no conflict of interest, aside from the development of the vaccine technology. A patent is applied for and held by the respective institutions. BC wrote the manuscript and conducted the studies with assistance in patient and data management by CL and RB; PH provided the vaccine; TM and SS managed and coordinated the chemotherapy where used and provided advice. All authors read and approved the final manuscript.